� A rare and significant individual that gives the indication of being a phenomena. 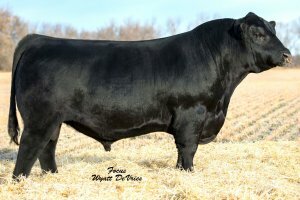 He was the lead bull in the 2016 National Western Stock Show Grand Champion Pen of Three Bulls and the $50,000 top-selling bull in the Frey Angus Ranch Sale in North Dakota. � Individual Performance: BW 78 lbs., BWR 94, 205 wt. 870 lbs., WWR 105, 365 wt. 1,495 lbs., YWR 104, adj. yearling scrotal measurement 40 cm. � Phenotypically flawless, being acceptable in size, correct in his structure, sound in his movement to be functional on the range and in the feedlot and still have a desirable end product. 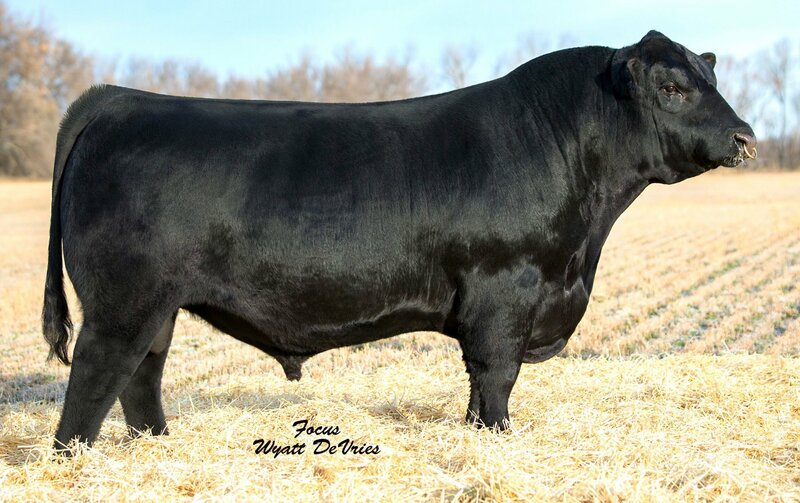 � His sire, Young Dale Xcalibur 32X offers outcross growth genetics (WW +83 and YW +129) from Barry Young�s herd in Canada with great performance and that pleasing appearance that is so hard to come by together. � Take advantage of the production look with good bone, big hip, power with a great head, smooth shoulders with that special pattern that is hard to find or duplicate.